Pantone, the commercial color company has announced its “Colors of the Year” for 2016. Here’s how to use the latest ‘in’ colors in your Microsoft Office documents. ‘Color of the Year’ is an end-of-year marketing trick by Pantone. It gets the company some free advertising and people talk about colors. As we explained back in 2014, Pantone colors don’t have a direct match because Windows/Office are setup for on-screen colors while Pantone is for printed materials. But you can get a close match if you know the trick. 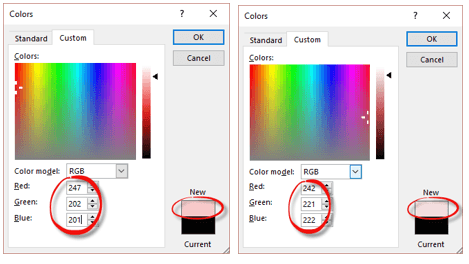 Pantone colors have a name ‘Serenity’ plus a code number ’15-3919′ – neither of which make any sense in Windows or Office. If you’d like to use the latest ‘in’ colors in your documents, slides or worksheets …. The Windows/Office/RGB equivalents are supplied by Pantone themselves.